vMix supports a number of independently controllable outputs depending on the edition. vMix 4K and higher supports 2x Fullscreen and 4x External outputs with all other editions supporting 1x Fullscreen and 1x External output. Outputs can be configured show a different source out of the options described on the Fullscreen help page. For example the Fullscreen output can be configured to show the MultiView Output without affecting what is sent to the Recording or Stream. These outputs control the computer Display outputs configured under the Display tab and are only available from the output ports on the Graphics Card. This is the primary output in vMix, also known as "Program". This is the Output that is used by the Recording, Stream and External 1. This is the secondary output in vMix which is also shared with the External 2 output. Any changes to the source here will affect what is seen on the External 2 output as well. These additional outputs are available for use with Video Call, Instant Replay and NDI only. This option can be enabled to automatically convert any cameras, calls and audio inputs in the current vMix session into live NDI outputs. See the NDI section for more information. This option can be enabled to convert all enabled audio buses under the Audio Outputs tab into live audio-only NDI outputs. If the Source option set to "Output" the Overlay check boxes can be used to customise which overlays are displayed on that particular Output. For example a "clean feed" can be set for the recording with all overlays turned off, while all the overlays can be retained on Fullscreen. Click Customise Inputs to change the order inputs appear in the MultiView monitor. The order of inputs can be changed according to their number. Additionally they can be ordered by type. 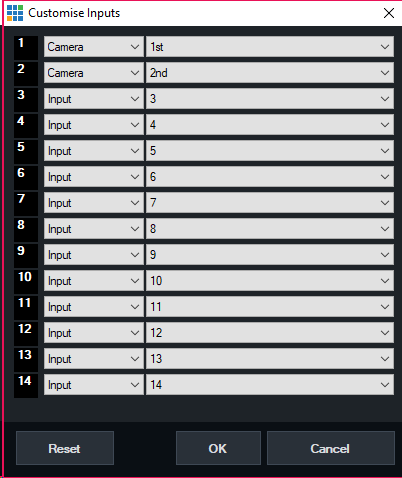 In the example below the first two cameras in a production will be shown in the first two MultiView input slots regardless of where those cameras actually appear in your production.